The delicate art of the twist — The Old Town Alchemy Co. There's one phrase you can guarantee that you'll hear at a cocktail competition. It's the one that starts, "This drink is a twist on..." The concept of modifying an existing recipe and presenting it as a new drink isn't new - look at the sheer volume of gin/vermouth/bitters recipes in the Savoy Cocktail Book, for example - but there's a point at which we should ask where the boundaries lie. This question - what constitutes a "twist"? - solidified for me at the Drambuie UK Cocktail Competition last month. I'd managed to sneak through the heat with an original recipe, but I'd be required to present both that drink and a twist on a Rusty Nail in the final. It's not unusual for brands to ask competitors to present a modified version of one of their signature cocktails but the Rusty Nail struck me as one of the most difficult to change. The problem is its simplicity. It has equal measures of two ingredients - Scotch and Drambuie - stirred and served on the rocks. There's nothing in the recipe that can be pared down or outright removed without changing the nature of the drink. So, if I view those two ingredients as fundamental to my version remaining a Rusty Nail, the only thing I can do is add ingredients. That created its own problems. Once again, I felt that adding too many ingredients would detract from the simplicity of the original formula. Adding a souring agent didn't seem appropriate, nor did overly lengthening the drink. After sifting through combinations of complementary flavours, I ended up doing very little. I added a measure of apple juice to counteract the thick texture of the Drambuie and flamed a couple of sprays of Absinthe inside the glass to add a striking aroma. The flipside to the approach I took was that it could be viewed as unadventurous and subsequently wasn't far enough removed from a standard Rusty Nail. Having seen my scores (which is a rarity in competitions) I guess that's the view that the judges took. It's hard to argue with the decision, and I came away knowing what things I need to work on for future competitions, but the question's still there. What constitutes a twist? Flamed a couple of sprays of absinthe into a small, chilled cocktail glass. Stir the other ingredients with ice and strain into the absinthe-rinsed glass. 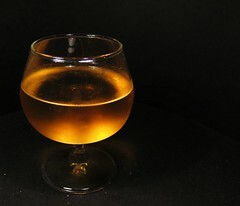 Posted on February 12, 2010 by Jon and filed under Mixology, Recipes and tagged absinthe cocktails competitions Drambuie Scotch whisky.